There have been a number of comments that Amazon RDS does not allow users access to MySQL replication capabilities (for example here and here). This is a pity. Replication is one of the great strengths of MySQL and the lack of it is a show-stopper for many users. As of the latest build of Tungsten Replicator half of this problem is on the way to being solved. You can now set up real-time replication from an external MySQL master into an Amazon RDS instance. In the remainder of this article I will explain how to set up Tungsten replication to an Amazon RDS slave, then add a few thoughts about why this feature is useful along with some suggestions for improvement. To keep the article reasonably short I assume you understand the basics of installing Tungsten Replicator. If you need more information, check out the online documentation. 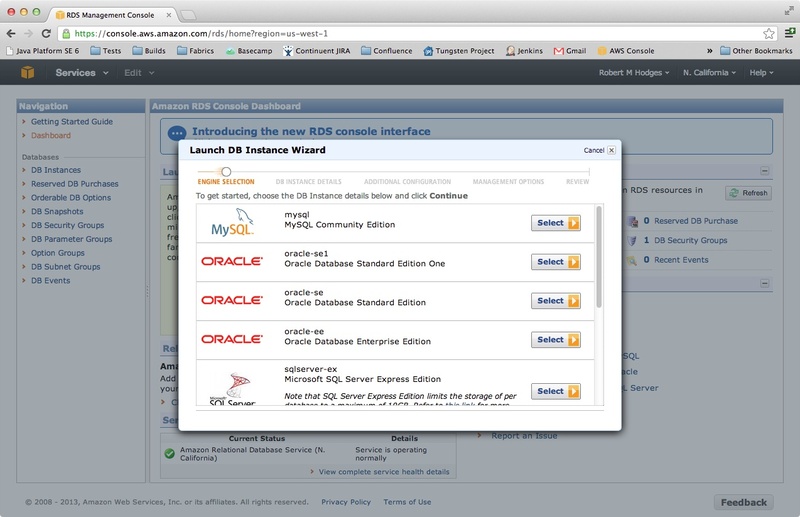 Press the Select button for MySQL Community Edition, which starts the configuration window. (You can also replicate into Oracle if you are up for a challenge. If you do this, please post what you did to get it to work!) Next fill out properties for MySQL. Among other things, you create a master login and password. Note these carefully as you will need them to configure replication. Then continue for another couple of screens, at which point you can launch your instance. It takes about 10 minutes for new instances to spin up, after which you can see the instance properties in the AWS RDS Console. Here's a screen shot of my test instance. Once the instance is up, test access. This is of course necessary to prove the instance is running properly and that we can login from a remote location. Note the host name in the Endpoint field. This is a DNS entry for the new MySQL instance. Using that and the master login, we can now fire up the mysql client from a remote host where we plan to run replication. This looks quite good. We are now ready to install and start replication. Important note! If you have trouble connecting you may need to tweak your Amazon security group settings to open up ports, especially if you are replicating from non-Amazon locations. Amazon has a very cool feature that can guess your originating host IP and offer a CIDR address that covers the port range from which you are operating. I used this when configuring my security groups. It is possible to set up replication from a MySQL master directly to Amazon RDS using a single Tungsten Replicator process. However, it is more versatile and simpler to set up two replicators: one to read from the MySQL master, and another replicator to apply to the Amazon RDS slave. I will therefore demonstrate this configuration. We will assume you have a MySQL master already running and that it meets prerequisites for running Tungsten. Let's now grab the Tungsten code and install a master replicator. You can get fresh builds from the Tungsten Replicator builds page. We will take a recent replicator build that contains the RDS changes, which are documented in Issue 425. Use 2.0.7 build 177 or later. The main improvement is to add a non-privileged slave mode that avoids invoking any of the operations forbidden by Amazon. Among other things Tungsten normally uses commands like 'SET SESSION SQL_LOG_BIN=0' to suppress writing to the binlog when it applies data on a slave. This command requires SUPER privilege, hence causes problems for underprivileged RDS logins. Unpack the code and install the master replicator in /opt/continuent. This is no different from installing a normal Tungsten master. My master host is logos1. Here are sample commands to pull the code and set up the master. The example shows the minimum options--if you have MySQL installed in a non-standard location or otherwise differ from a stock installation you may need to add additional options. Next, set up the slave replicator. For convenience I am going to install the slave on a separate host, named logos2, to avoid port clashes between the two replicators. If you install on the same host, you'll need to install into another release directory location and use the --rmi-port and --thl-port options to avoid port overlaps. Here is the command to set up the Amazon RDS slave. Note that the tungsten-installer program can install code between hosts, which is an extremely useful feature. Both replicators should report that they are online. Now complete the exercise by proving that replication works between the replicators. We start by logging into the local MySQL instance, creating a new table in the test schema, and adding data. Now login to the Amazon RDS instance and look for table foo. Mission accomplished! 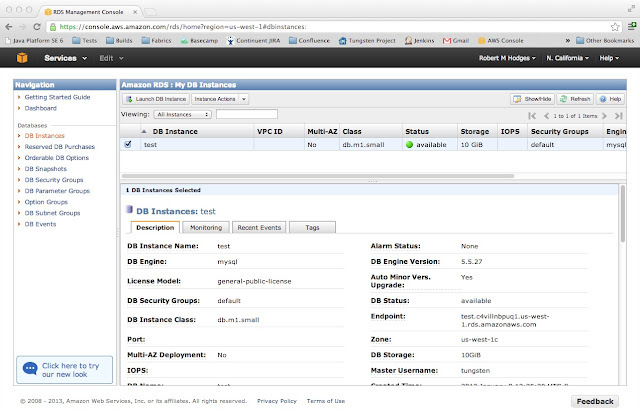 We have real-time replication enabled from a MySQL master to Amazon RDS. At this point you can replicate more or less normally. There are some obvious limitations due to the fact that Amazon RDS is locked down and does not grant our login full privileges. Any command that requires SUPER privilege will not work. As an obvious example, you will not be able to grant SUPER privilege to new accounts. Such commands will break replication. All replicated commands go into the binlog, which is a potential performance drag and may slow down Amazon RDS slaves. Parallel replication may not help in this case, since committing to the binlog is a serialization point that blocks other transactions. This problem may be cured if Amazon picks up group commit fixes from MySQL 5.6 and/or MariaDB. All things considered, however, these are minor inconveniences. Most applications should be able to replicate without difficulties, especially if the master transaction rate is not too high. In the previous demonstration I used a master host running outside Amazon. This means my test transactions traveled across the Internet, where they were visible to all and sundry along the way. To illustrate, we can run tcpdump and watch traffic as it goes by. If we were handling confidential data, exposing traffic like this to possible evildoers would be a serious problem. Fortunately, Amazon RDS supports SSL encrypted connections from clients. Here is how to use it with Tungsten. First, you need to get the Amazon RDS certificate, which is used to sign certificates for individual RDS instances. Next, you need to create a trust store that Java can access containing the certificates of signing authorities whom you trust. For this you will need the Java keytool utility, which is included in the JDK. If you are just using the Java runtime in production, you will need to generate the store on another host, then copy it over to your test hosts. I used the password "secret" in this example. We now need to tell the slave replicator about the truststore file using Java VM options. On the slave host, edit /opt/continuent/tungsten/tungsten-replicator/conf/wrapper.conf and add the extra options shown in bold face. The last step is to enable SSL encryption when applying data. We need to set an extra URL option on the drizzle JDBC driver to turn on SSL. For this we need to edit the static-svc.properties file that configures replication. In my example this file is located in /opt/continuent/tungsten/tungsten-replicator/conf/static-aws.properties. Open the file and look for the section that starts with APPLIERS. Edit the text to add additional urlOptions line as shown below. Restart the replicator process (/opt/continuent/tungsten/tungsten-replicator/bin/replicator restart) and you will now be using SSL encryption. If we now look back at the tcpdump outout, it looks like garbage as the following example shows. This is much better. We are replicating to an Amazon RDS, and the transactions are safe from prying eyes. If you have gotten this far you are ready to try your own applications. Amazon RDS is convenient thanks to its quick and simple setup, but the lack of replication is a severe limitation in building systems that need more than a single MySQL instance. In particular it makes it hard to integrate RDS into systems that consist of more than Amazon RDS itself. Adding the ability to replicate in real-time into RDS therefore has a number of benefits. The most obvious include using RDS to extend existing systems. 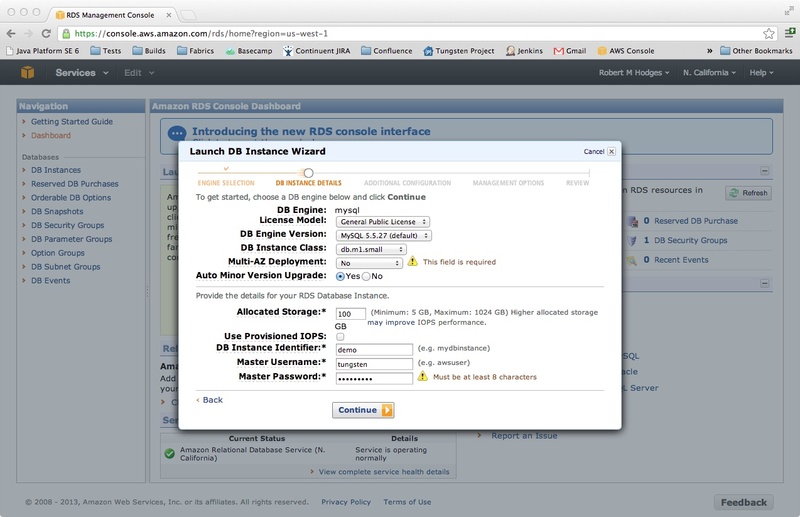 First, Amazon RDS can offer a quick way to add read capacity to existing MySQL applications. This is especially useful if you have a cluster, such as Tungsten, which handles your transaction processing and overall HA. You can now add Amazon RDS read slaves that you discard when no longer needed. Tungsten Replicator has a number of other useful features like the ability to read from a group of nodes, not just one, that make such topologies easy to set up and maintain. Clusters other than Tungsten will likewise benefit from this feature. Second, Amazon RDS is suitable for applications that do not need 24x7 high availability (limitations include slow failover, no online maintenance, no cross-cloud capabilities, etc.) You can now pull data from other sources and send them to Amazon RDS slaves for processing, which amounts to extending overall processing capacity. 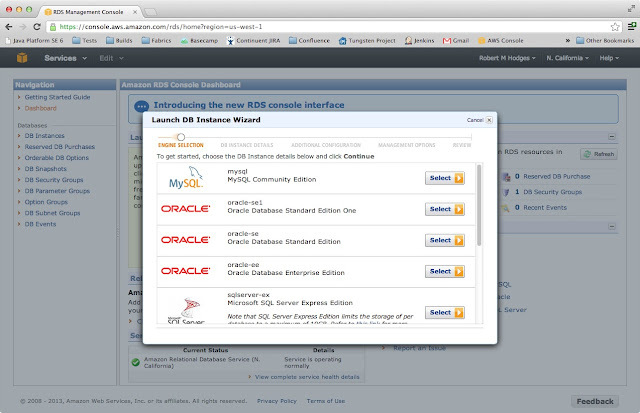 For example, you could use RDS to run back-office tasks using transactions replicated in from MySQL masters. Tungsten Replicator also replicates data from Oracle, so this is an additional source of transactions. There are of course other ways to replicate data to and from RDS, for example using batch ETL tools like Talend. However, these are not real-time and often require application changes to add timestamp columns or otherwise mark transactions that need to be extracted. Log-based replication as implemented by Tungsten is fast and has minimal impact on applications or MySQL itself. On our side, i.e., at Continuent, we need to do more testing, add documentation, and fix problems as they arise. We are starting a beta test with one of our customers in the next few days, who incidentally was the same customer who requested this feature in the first place after hacking it for themselves. RDS also has some interesting provisioning capabilities that I would like to understand better. We are also adding options that eliminate the need for manual configuration of security settings. This will keep us busy for a while. Replication is such a valuable feature of MySQL that Amazon RDS feels somewhat crippled without it. For this reason I would imagine that Amazon will open up additional capabilities in the future. Until then we will polish up replication from MySQL masters to Amazon RDS slaves, awaiting a time when we can add more features. In the meantime, I hope you will try the new replication to Amazon RDS. As noted in this article you can grab the latest builds and try it yourself. Please report your experiences through either Continuent Support if you are a customer or the Tungsten discussion list if you use the open source Tungsten Replicator. I look forward to your feedback and suggestions for making Amazon RDS support better. We have started a new series of webinars at Continuent that we call Tungsten University. They provide education on Tungsten clustering and replication in handy one-hour chunks. These are not sales pitches. Our goal is to provide accessible education about setting up and operating Tungsten without any marketing fluff. The first Tungsten University webinar entitled "Configure & provision Tungsten clusters" will take place on Thursday January 17th at 10:00 PST. 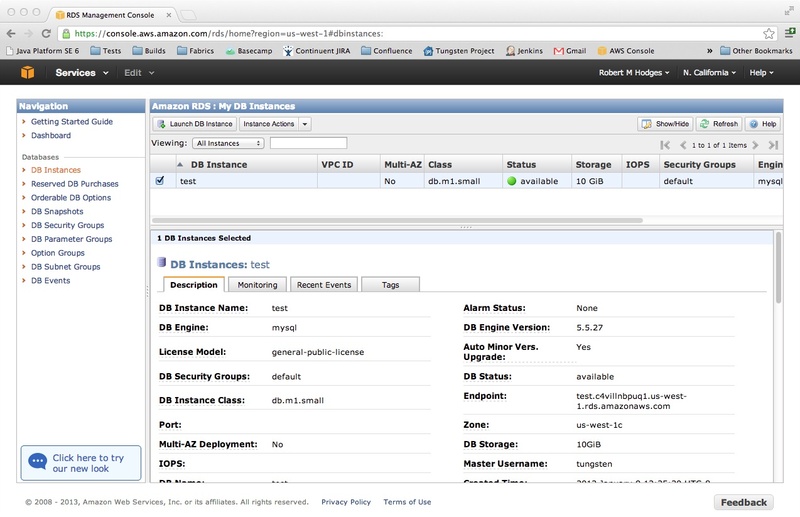 It will show you how to set up a cluster in Amazon EC2. There will be a repeat on January 22nd at 15:00 GMT. We usually record webinars, so you can look at them later as well. There will be more titles out soon, so watch our webinar list and the announcements on the Continuent Tungsten blog. If there are topics that you would like to hear about please suggest them as comments on this blog or the official Continuent blog. Meanwhile, I am looking forward to doing some of the replicator presentations and attending the talks on clustering. I mostly write code for the replicator, so talks about other parts of Tungsten tend to be learning experiences. The Tungsten Connector is particularly interesting because it makes off-the-shelf database replicas look like a single DBMS server and transparently switches connections between them. It is our secret sauce for creating master/slave clusters. If you have not seen Tungsten Connector before, I recommend attending that talk when it comes up. I'm still amazed how well it functions even after working with it for a number of years. The recent release of the MariaDB client libraries has prompted questions about their purpose as well as provenance. Colin Charles posted that some of these would be answered in the very near future. I have a couple of specific questions about the MariaDB JDBC driver, which I hope will be addressed at that time. 1.) What is really in the MariaDB JDBC driver and how exactly does it differ from the drizzle JDBC driver? What, if any, relation is there to Connector/J code? There is a JIRA project but it contains only four bugs, hence is not very informative. The launchpad bzr history shows detailed check-ins but not overall intent. 2.) Why relicense from BSD to LGPL? I have checked the class headers and so far as attributions are concerned everything seems to be done quite properly. However, the license change appears to prevent those of us currently using the drizzle JDBC driver from transferring code changes back to the drizzle driver. If so, that seems a little unneighborly. Here is some background on the relationship between the drivers. The MariaDB JDBC client is a fork of the BSD-licensed drizzle JDBC driver originally developed by Marcus Eriksson, who continues to maintain the code. According to the bzr change history the code forked after rev 253, which was 24 April 2011. There are still many similarities in the Java classes. For instance, a number of classes in the org.mariadb.jdbc.internal.common package differ by little other than licensing headers and package names. The MariaDB code is now up to rev 375 and includes substantial changes that appear to be designed to bring the MariaDB JDBC driver closer to the capabilities of the MySQL Connector/J driver. At Continuent we have a lively interest in the drizzle JDBC driver, as we adopted it for Tungsten Replicator some time ago. The code had fewer bugs than Connector/J, which was attractive. More importantly, Marcus kindly accepted a patch from my colleague Stephane Giron (working as a Continuent employee) that made it easy for us to send queries using binary data rather than the usual Unicode data required by the JDBC standard. This fix allows Tungsten to replicate codesets and binary data correctly. We have since contributed a few other patches. Our modest contribution in part reflects the quality of the base code. While waiting for answers I would like to commend Marcus as well as other drizzle contributors for their work. We are particularly indebted to Marcus for starting and continuing the drizzle JDBC project. Tungsten Replicator users have applied many trillions of transactions using the drizzle driver. If the MariaDB JDBC driver gains wide acceptance, the rest of the MySQL community owes Marcus Eriksson substantial thanks as well.